The upside to having surgery is that I've been overwhelmed by how many people have given me support. All the comments on my blog have meant so much to me. They truly helped me through this, especially those first few weeks. 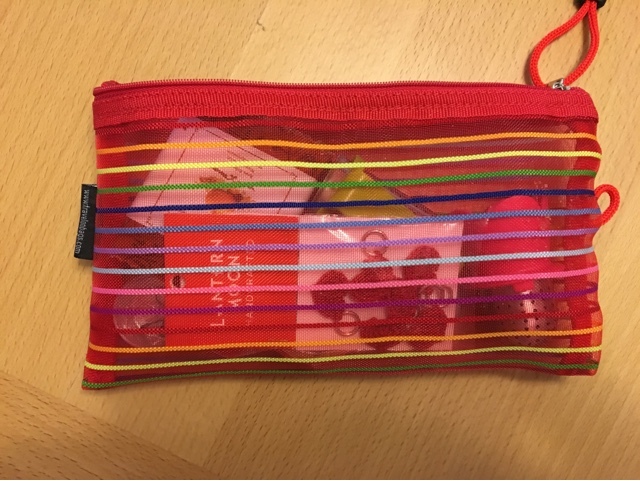 ... repositionable markers, washi tape, knitters gift tags that are adorable beyond belief, and sweet nail files that fit in any purse! Thank you so much, Rose! You really cheered me up at a tough time. Another friend who went beyond and above is my childhood best friend, Joni. We were supposed to meet in Seattle, but my doctor said I could not fly this summer. Instead, she flew from Berkeley, Calif., to spend time with her post-surgical friend. 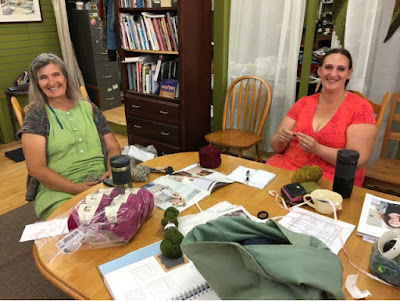 We had lots of craftsy adventures. But thats another post! P.S. Now that she has headed back home, I'll be catching up on all your blogs. 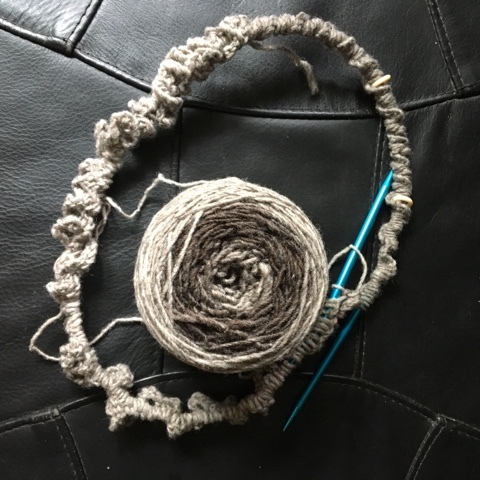 Many of you commented on the challenge of casting on 472 stitches for my Winter Ridge Cowl Shawl (that is really a poncho). 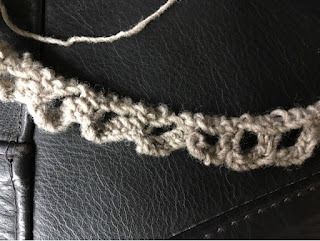 Vicki noted that she uses stitch markers every 20 or 25 stitches. 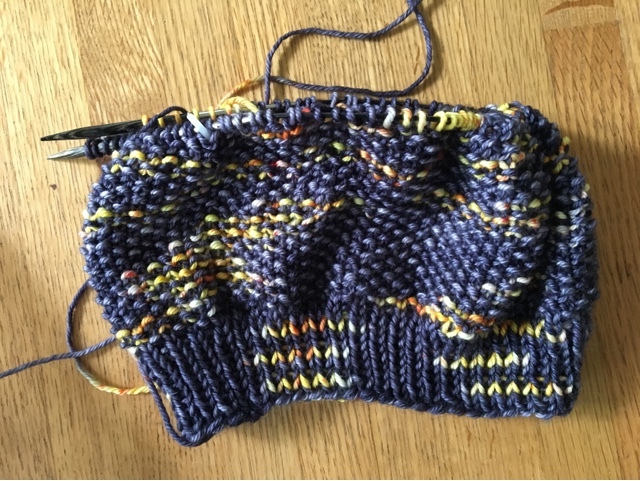 I couldn't cast on a lot of stitches without markers! For this project, I used stitch markers every 50 stitches. Using them every 25 stitches would have given me too many markers to keep track of. It was painful, but it worked out. And I'm very happy with the project so far. I am a true believer in the long-tail cast-on. I was taught by a Norwegian woman when I was 10, and I can do it in my sleep. It is flexible and looks great. But even I don't want to try to figure out the tail for 472 stitches especially with yarn that ain't cheap! 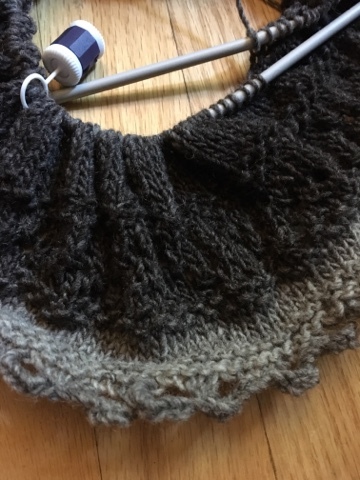 For this project, I used the cable cast-on (which has nothing to do with cables, as far as I can tell). I don't think it's as stable, but it did the trick. Update: I had my staples out today, and the healing is going well. The nurse warned me that it will take a full year for my incision to heal! But I should be able to drive soon, so I'll settle for small victories. 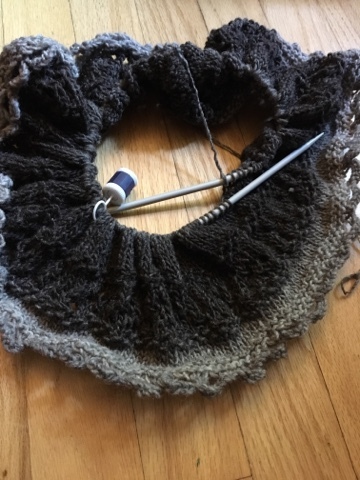 As long as I have to spend a lot of time lounging around, I thought I'd start my Winter Ridge Cowl Shawl. It requires casting on 472 stitches. Seriously. After you finally finish casting on all those stitches, you get to make the adorable loops that go around the bottom. This part is way more fun than casting on and counting. I especially hate the counting part. I am reading a really great mystery. 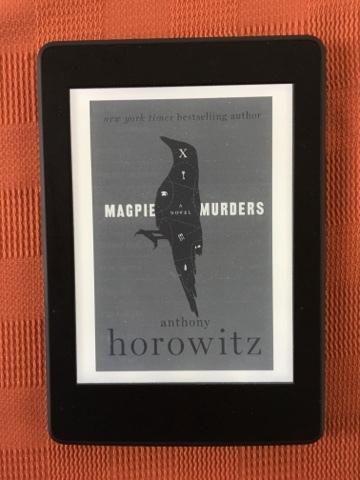 I rarely pick up mysteries because I burned out on them a long time ago, but Magpie Murders got such great reviews that I actually purchased it for my Kindle. And it is every bit as good as the reviews said. I don't want to give away too much, but let me say that it is a cozy English mystery wrapped inside a contemporary mystery. I think the story-within-a-story gig is hard to do well, but Anthony Horowitz has built two solid stories. I'm not done yet, but I bet the ending won't disappoint. Join us over at Unraveled to share what you are knitting and reading. 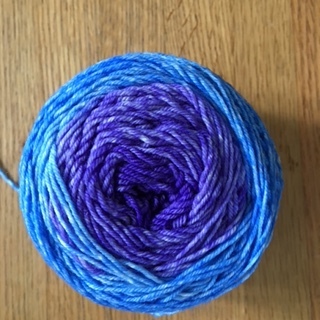 This is an Antarktis in a Knit Circus gradient (can't find the ball band!). I thought I had too much yarn, but I was wrong and I had to end a bit early. I can't move around enough to block yet, but I'm sure it will block out to a good size. I finished the painting I started on a day trip Keith and I took before my surgery to Viroqua, Wis. This is a beautiful old building. To me, the touching thing is the For Sale sign along the side of the building. I'm not sure painting is the right word because I used Derwent Inktense Pencils, my usual medium. I packed up a box of hand knits for the folks on Pine Ridge Reservation, one of the most poverty-stricken areas in the United States. You can learn more about this project at the Ravelry group. I mostly sent mittens and scarves. 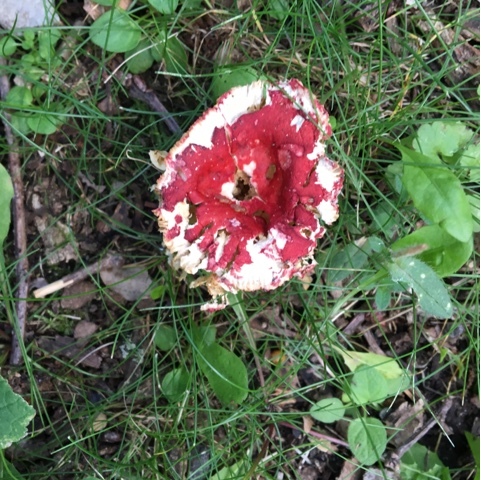 It's a mushroom, not a flower. Summer break is roughly half over, and it's going way too fast! When I can move around a little better, I need to go into school and start getting organized for next year. I learned the hard way last year that the pace is very fast in high school and I need to hit the ground running! I have been able to do a few outings since my surgery. The most fun was a visit to Studio You with my friends Marsha and Tsela. As you can see, I'll have to go back to finish this one. Both Marsha and Tsela are talented artists. 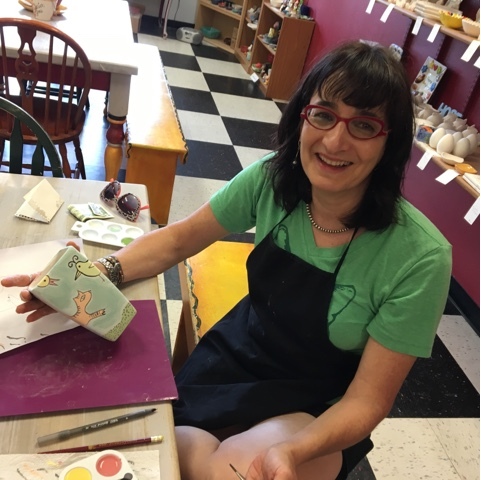 Here's Tsela with the vase she painted. I reminded her when my birthday is. Marsha had knee surgery a few weeks ago, so we both very much appreciate Tsela ferrying us around and putting up with our very slow walking pace. 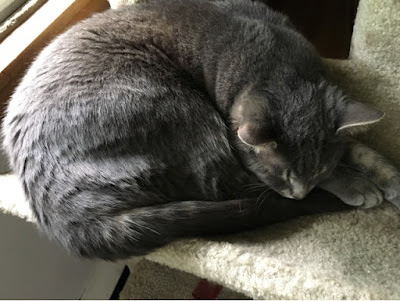 For the most part, though, I'm just hanging around the house and trying to heal, welcoming visitors, knitting, reading and spending time with Nagi. He's very cute, but not much on conversation, as you can see. Hope your weekend is relaxing and fun. When you are under doctor's orders to sit around all day, you can get a lot of knitting done! 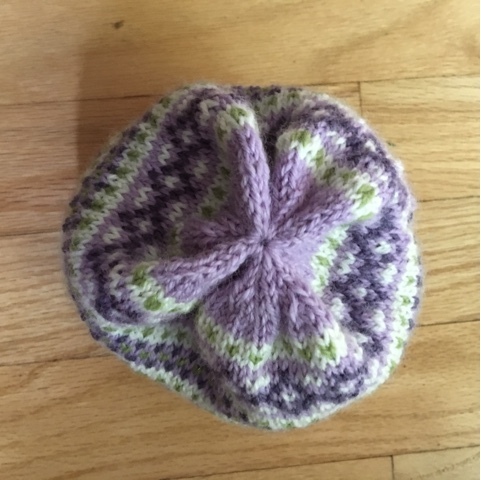 As a result, I have two finished hats to show you. This first one is the Toboggan Run I was working on earlier this week. Details are here. It's a great pattern if you don't mind miles of seed stitch. I think it's worth it. 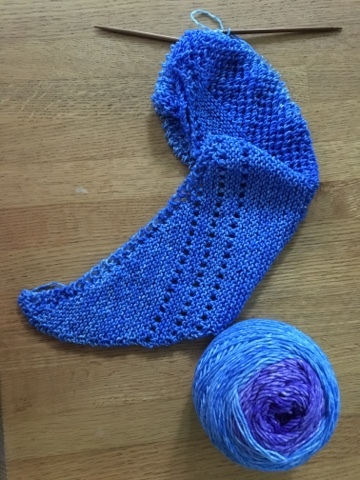 I love the yarn and tried to get more online, but I don't think it's possible😞. It will be a holiday gift. One down! I don't think it qualifies as a Fair Isle design because some rows have three colors. I've wanted to figure out how to do that. My method is clunky, but it gets the job done. 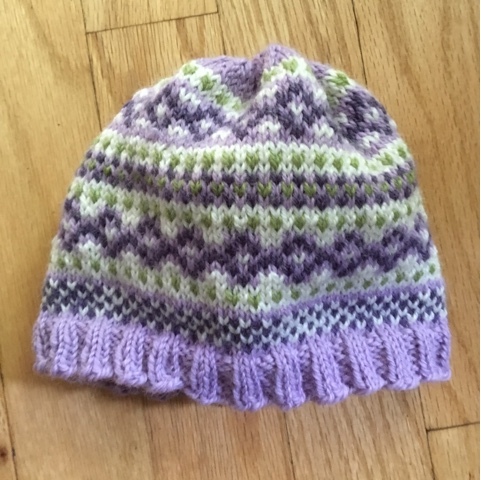 I used Encore DK yarn because it's inexpensive to experiment with, hard-wearing, and washable. Now I need to get the model over here to see if it fits! I feel so lucky to be part of this blogging community. I can't thank you all enough for your comments and thoughts and prayers. Especially being cooped up in the house, it really helped to feel all that support from all of you! So, an update: The incision seems to continue to heal. I have been doing a good job playing couch potato, partly because it hurts less when I don't move! I really can't complain. I've had good care and good company. I am VERY squeamish, though, and I kind of freak out when my hand brushes against a staple! 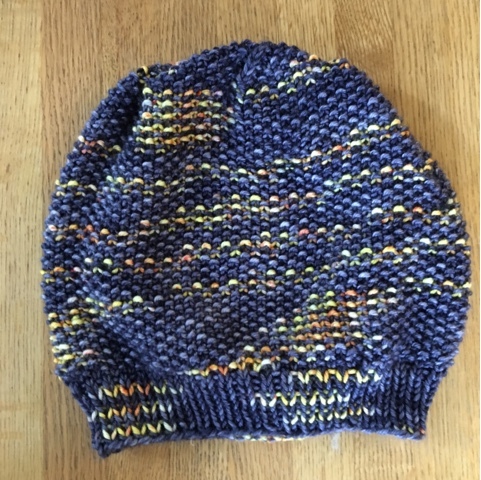 I set up a few hat projects before my surgery, including this Toboggan Run, a pattern by Jaala Spiro of Knit Circus. Isn't the yarn fabulous? It is Fox Trail Fibre Arts MCN Worsted. 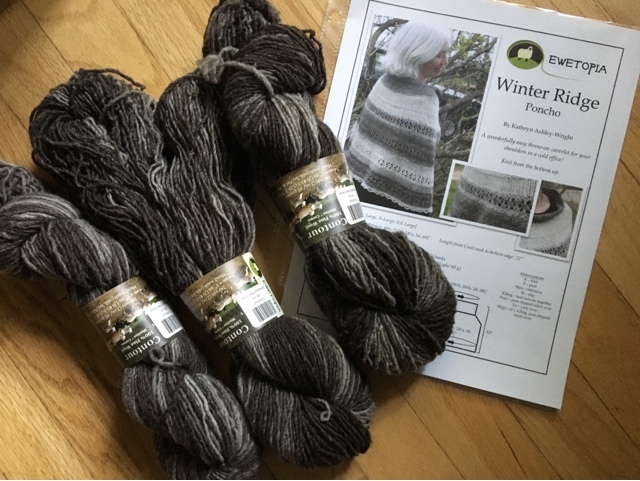 I picked up this skein in Montreal last year. The yellows and oranges really pop out from the dark gray. It's going to be a gift. I kind of hate to give away the yarn, but there is a limit to how many knitted items one girl needs! Still reading these two books. The Sixth Extinction bogs down in the middle and is very depressing -- a litany of how we are destroying the oceans and the forests, etc. I appreciate that we need to know this information, it's just hard to read. The last couple chapters are more varied, though, and I should finish this soon. 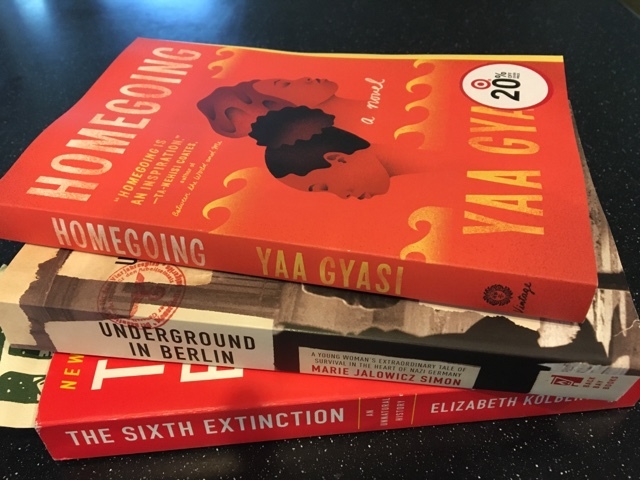 Homegoing is a sweeping, multi-generational story of eight generations beginning with two half-sisters in Africa during the era of the slave trade. It is an important book, but not always easy to read. Joining up with Kat for Unraveled. I'm sure that none of use bares all online. I certainly don't want to advertise all my short-comings to the world. Then there is the question of tone; I don't want to be moaning and complaining all the time. Who wants to read that? And often the difficulties in our lives involve other people, so we need to respect their privacy. I've been thinking about what to share online a lot since early May, when I was diagnosed with a skin cancer, Squamous Cell Carcinoma. This is generally a very treatable cancer that stays on the surface of the skin. However, this lesion on my right thigh was misdiagnosed by a dermatologist a decade ago, so has grown unchecked -- until it bothered me enough to see another dermatologist this past spring. It took the dermatologist less than a second to look at it and order a biopsy. I knew then that it had to be cancer. The biopsy came back positive and a Mohs procedure was scheduled for July 6. 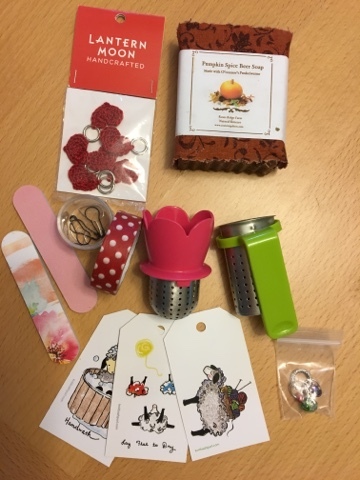 Two months is a long time to wait when you don't know the extent of the cancer, but the rush of the last month of school helped distract me, as did the trip to Copenhagen. The Mohs procedure went well. The doctor is reasonably confident they removed all the cancer, but she is going to put me on a chemo surface treatment when the incision heals. And the incision is healing beautifully so far! If I get through the next week without any signs of infection, I'll be in the clear. I should mention that my husband is an amazing nurse, and my incredible daughter flew in from Florida to be around at this time. Of course, my mom is here in Madison, too, to help out. That's the good news. Here is the lesson: Be paranoid about odd things on your skin! I don't know how the first dermatologist missed that this lesion was cancer, but I sure wish I would have gotten a second opinion! It would have been a much easier procedure when a smaller area was involved. As for knitting ... the photos are of an Antarktis, my second. Until the surgeon went in with the Mohs, we didn't know how deep the cancer was or what the recovery would be like. 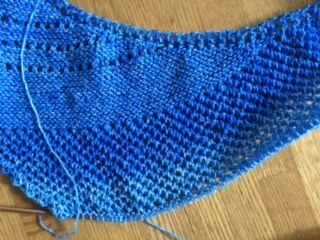 In the days before the procedure, I set up this project as a mindless, soothing knitting activity. And it has been perfect. I'm usually careful about keeping track of ball bands, but somehow I lost this one. What I can tell you is that the yarn comes from one of my favorite (and local!) 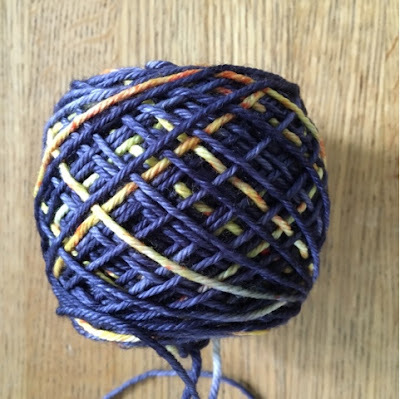 dyers: Knit Circus. 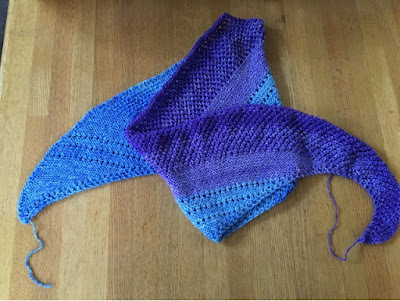 Fortunately, the recovery is going very smoothly and I can also work on other projects, so I won't be boring you with endless photos of this shawl! I haven't been up to reading blogs and commenting, but I'll be starting that today. I look forward to seeing what you've been up to! 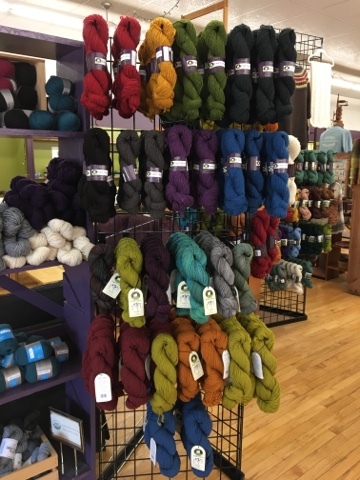 As most of you guessed, I did buy yarn at Ewetopia on Saturday. But I did not go crazy. I limited myself to one pattern and yarn to go with it. I think this poncho is going to be very practical, as well as pretty. My love of color tends to drive my yarn choices, but this time I went with natural-colored yarn. 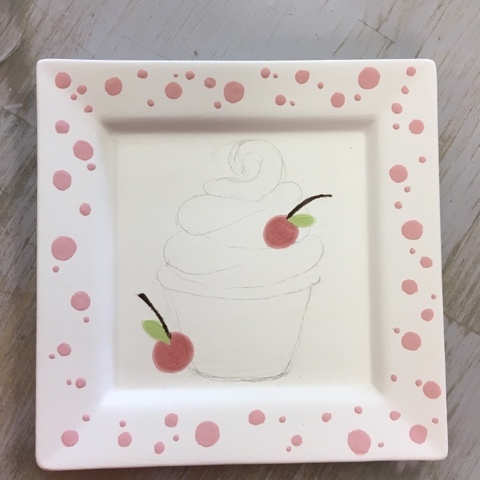 I like the way it looks in the photo that on the pattern. However, this year's sheep gave off darker yarn, so mine will not have as much white as the one in the photo. That's OK. I invariably spill on anything white. I'm still working my way through The Sixth Extinction. I've been doing too much of my reading at bedtime, so I went back last night and re-read a few chapters. It was worth the extra time. I'm still reading about historical extinctions, and it is just fascinating. The author is a journalist, and her style is clear and engaging. 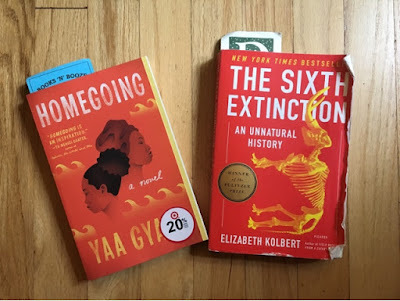 I want to start a second book, but I haven't decided between the two in the photo. Both look really good! Don't forget to join with Kat for Unraveled today. 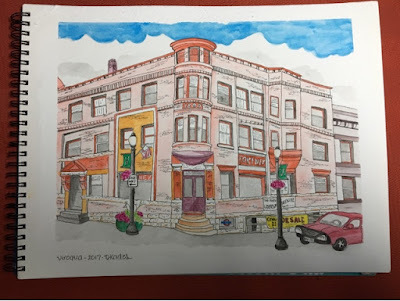 On Saturday, Keith and I decided to head up to Viroqua for the day. It's a town in the Driftless Region, which is hilly and pretty because it was not flattened by any glaciers. My main goal was to sketch, but I'm still working on that drawing. This is Ewetopia! It is both a brand and a store. 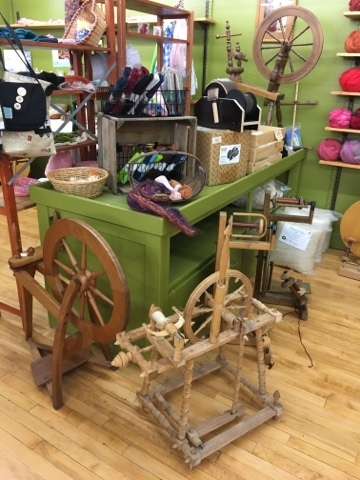 The store is gorgeous -- airy and comfy and filled with yummy yarn. 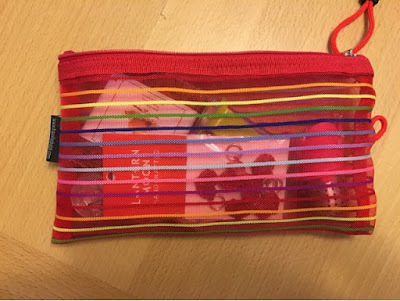 There is a wonderful are for knitting and another for children to play. Everywhere you turn, there are are surprises, like handmade pewter buttons. The business is owned by Kate Ashley Wright (right) and her mom, Lisa Ashley. 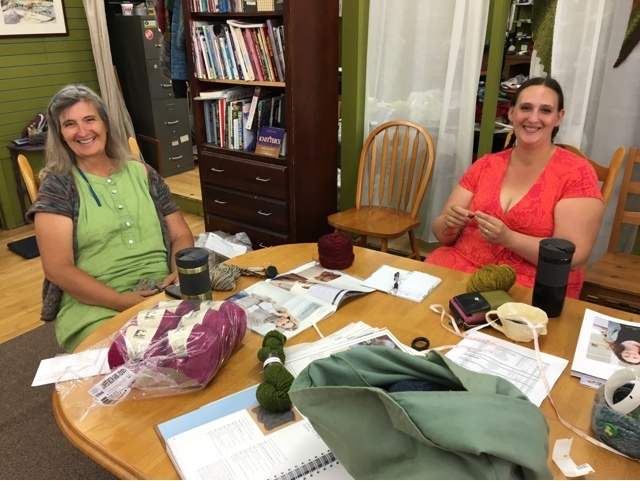 They are so warm and friendly; you just want to sit down with them and knit! 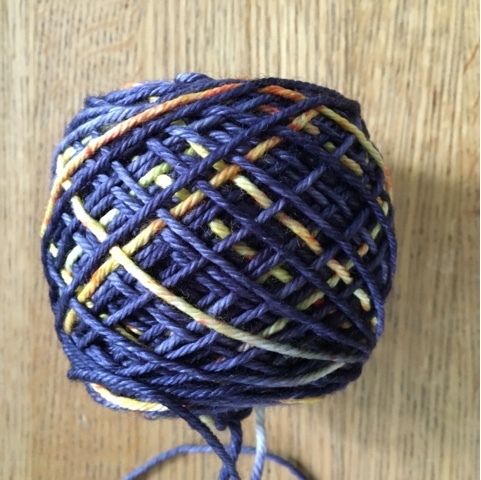 Ewetopia yarn is beautiful. The colors are luscious and the yarn is soft and inviting. Kate and Lisa also write patterns. Last year, I knit up the Winter Ridge Poncho, using their pattern and yarn, and it is both beautiful and wearable. 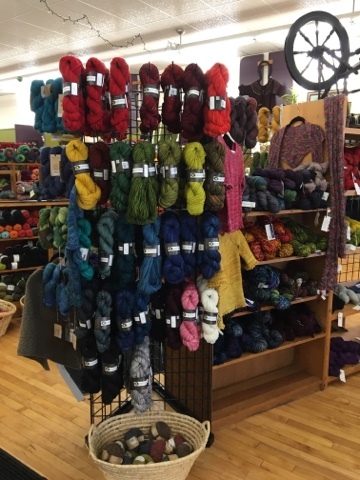 I haven't been to the store before; fortunately for me, they vend at the Madison Knitting Guild once a year. 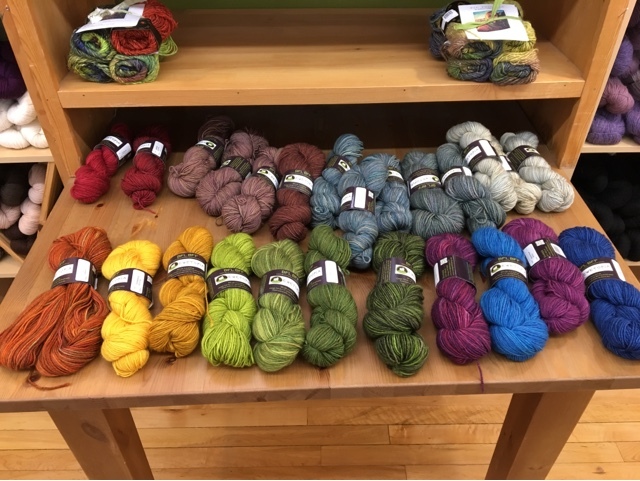 I spent a ton of time wandering around the store and petting the yarn! Aren't the Ewetopia colors beautiful? And isn't Ewetopia a brilliant name? If you're not driving distance from Viroqua, don't worry. You can visit the store virtually and shop online here. So, do you think I bought anything?